To differentiate instruction is to act on the belief that all kids deserve access to the richest, most compelling learning experiences and to provide the scaffolding they need to seize that opportunity. While a handful of teachers in a school might be using differentiation to great success, it takes a collaborative, schoolwide approach to maximize differentiation’s effectiveness and improve outcomes for all students. 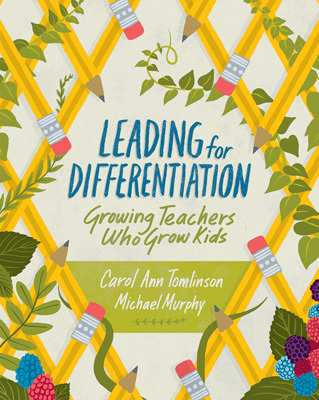 Leading for Differentiation lays out the reflective thinking and action-oriented steps necessary to launch a system of continuous professional learning, culture building, and program assessment that will allow differentiation to flourish in every classroom. Leading the change to a differentiated school means creating an environment in which each individual feels valued, challenged, supported, and part of a team working together for success. In this book, school leaders will learn how to set the course for positive change and create the structural supports that will help teachers grow as differentiators so that their students will thrive as learners. This is not a member book. Join ASCD or upgrade your membership. Infographic: What Is (and Is Not) Differentiated Instruction? Look at the definition of differentiation—in terms of what it is and is not—in this infographic to further your learning from the book. Post it in your office, share it with your colleagues, or circulate it on social media to keep best practices for differentiating instruction to meet the needs of all students top of mind. CAROL ANN TOMLINSON is the William Clay Parrish Jr. Professor and Chair of Educational Leadership, Foundations, and Policy and co-director of the Institutes on Academic Diversity at the Curry School of Education, University of Virginia. She works throughout the United States and internationally with educators who want to create classrooms that are more responsive to a broad range of learners. MICHAEL MURPHY is an educational coach, facilitator, and consultant with 39 years of educational experience in urban, suburban, and rural school district settings. Much of Mike’s work supports school and district leaders in planning and implementing large-scale improvement initiatives, visioning, understanding change and its effect on people, evaluating school improvement progress, designing exceptional professional development, and engaging people in productive, relationship-rich, results-based conversations.